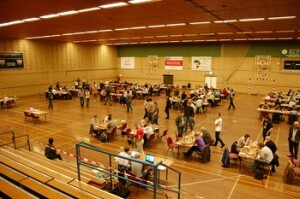 The 4th ENCI Limburg Open took place in Maastricht from 21 to 24 May. Almost three hundred players took part, divided into three Sections according to rating. The top Section was a FIDE-rated seven-round swiss tournament with one hundred participants. Seven Grandmasters took part, including four (Miroshnichenko, Fedorchuk, Gharamian and Berg) who are rated over 2600. The two winners, each managing five wins and two draws, were Tigran Ghramian from France and Evgenij Miroshnichenko from Ukraine. Gharamian took the title by virtue of his better Buchholz tie-break score. Both players managed Tournament Performance Ratings of over 2800. Gharamian had a particularly crushing win against the third-placed player Friso Nijboer (the game is reproduced below). Tom Wiley and Frank Hoffmeister were the two entrants from Europchess. We both took a half-point bye in Round 1, in order to avoid getting stuck in the Friday afternoon traffic coming out of Brussels. We travelled together on Saturday morning; the journey took just over an hour, making this one of the more easily accessible tournaments in the calendar for Brussels-based players. Frank finished with four points out of seven, and a Tournament Performance Rating of 2275. His best win, against the Dutch WIM Lisa Schut, is given below with notes by Frank. Another noteworthy result was his draw with Black against the 2008 Belgian champion IM Bruno Laurent. In contrast, another leading Belgian IM Bart Michiels beat him in 60 moves, making use of the bishop pair in an otherwise equal endgame. Tom finished with four and a half points out of seven, and a Tournament Performance Rating of 2356. He scored convincing wins against lower rated-players, but lost with Black against GM Andrei Shchekachev after an interesting struggle in a Hedgehog position. His fastest win (given below with notes by Tom) was in the last round against the Dutch player Arno Henzen.